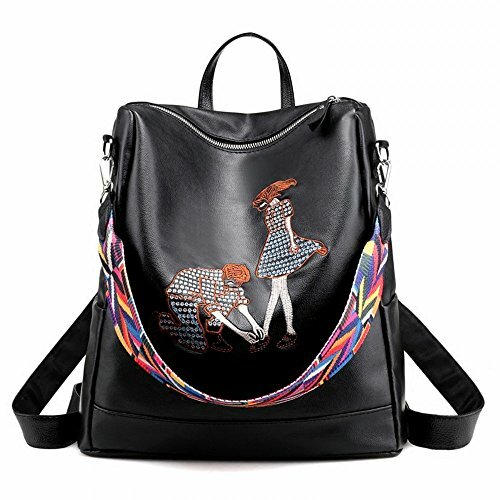 Looking for a vegan backpack purse? We've selected 9 options that you're going to love. Now you can travel around in style knowing that you're using cruelty-free faux leather. 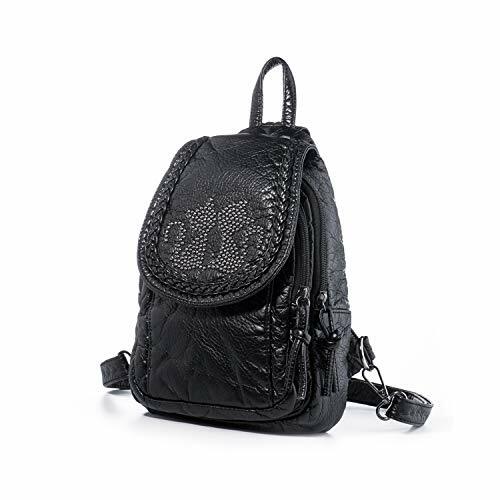 Perfect for work or play, this ladies' soft black vegan leather backpack purse features contrasting smooth and textured faux leather and braided detailing down the center. Comfortably wide straps are convertible to transform the backpack to a shoulder bag. Comes with an anti-theft back zipper that opens to the main compartments. Pros: The office, the museum, the park — you can really take this bag anywhere. It's a sleek, affordable, everyday bag for all your essentials, including your tablet and laptop. Cons: The anti-theft back zipper should help keep your stuff accessible only to you when you're wearing it, but it's not a fortress — if someone snags your bag, they can get inside. 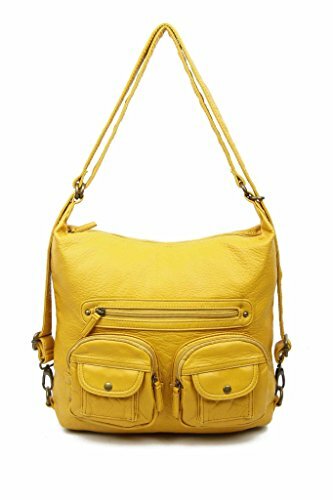 You get three bags in one by adjusting the straps on this mustard yellow backpack purse: a backpack, a crossbody bag and a hobo shoulder bag in buttery-soft vegan leather. Nice and roomy with 15" L x 12" H x 4.5" W dimensions. Has multiple outer pockets in the front and back to stash the little things like hair ties and notepads. Pros: Such versatility really comes in handy, especially if you're taking a sightseeing vacation. And the mustard color is so chic. Cons: It's decently sized, but it does have its limits. Consider how large the items are that you'd need on an active trip. This trendy, vibrant blue backpack is made of textured vegan leather in the front and nylon in the back. Top handle and straps are black to accentuate the vivid blue. Conveniently convertible to a shoulder bag. Advertised as vegan: No, but the materials used are faux leather and nylon. Pros: Excellent for day trips and light shopping. It's sophisticated but casual enough for sporting with jeans and a tee. Bonus points: the vendor advertises this backpack/shoulder bag as unisex due to its universal appeal. Cons: If you're searching for a vegan leather backpack purse, this may not be your style as it's mostly nylon — only the front is leather. A backpack and shoulder bag combo that's excellent for toting around your tablet and smaller textbooks in style. 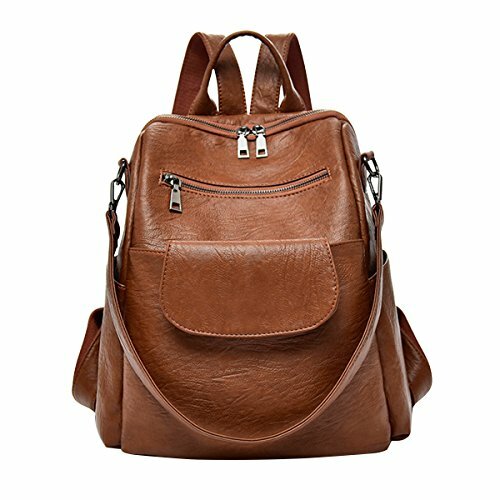 Made with supple brown vegan PU leather and sturdy metal hardware. Shoulder bag strap is removable. Pros: It's a perfect mix of backpack and purse for college students (or anyone) shopping for a functional and attractive bag you can sling over your back or shoulder. Cons: As a school bag, it does have a large carrying capacity, but it might not fit all your large textbooks. Make sure to take measurements first. Match your bag to your lipstick with this fiery red envelope purse that can be worn two ways: as a backpack or a crossbody bag. Its contours are outlined in black for a striking contrast. Fastens with a magnetic closure. Advertised as vegan: No, but this bag is made of faux leather. Pros: Not every backpack can be your evening bag like this one. It's posh and as a daytime backpack and fabulous as a crossbody bag over a shimmery cocktail dress. Cons: A zipper would be more secure than the metal closure, which might limit the functionality of this bag. 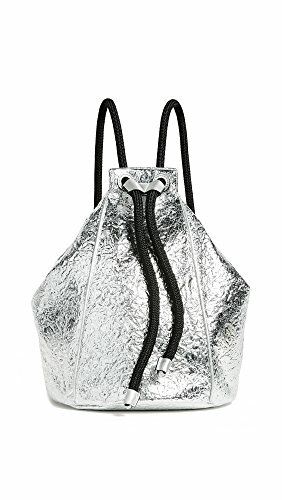 This drawstring backpack purse is for style hunters on the cutting edge of fashion, featuring crinkled faux leather in bright and shiny metallic silver. Zips shut and tightens with black woven nylon straps. Includes interior pockets for the little things like keys and ID. Advertised as vegan: No. This stylish bag is advertised as faux leather. Pros: Killer fashion and a nice change-up from your regular, everyday purse. We appreciate that it secures with a zipper even though it's a drawstring bag. Cons: It's pretty pricey, but not as pricey as on sites like Shopbop. Good things come in mini packages. 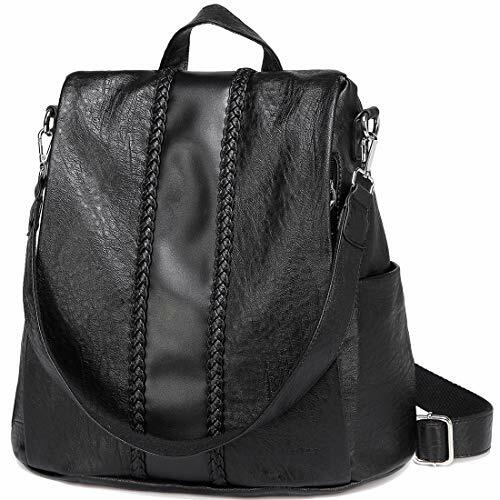 Put the shoulder straps together and turn this black vegan leather backpack into a sling bag. Features two kitties in silver studs on the flap. With 9" L x 10.5" H x 3" W dimensions, this backpack can hold an iPad mini and all your purse necessities. Pros: Ridiculously affordable and unique with its silver studded design. The small and unobtrusive size makes it ultra light and comfortable for all-day wear. Pair with a vegan moto jacket and cateye specs. Cons: As a mini backpack, it can only hold so much, but that's only an issue if you need a bag to carry bigger items like a full-size laptop. Need something in between a tote bag and a backpack? Why not both? Studio 33 brings you the best of both worlds in black faux leather with glittering palm trees on the front. Solid handles on top allow you to carry your weightier items. Zips securely shut to protect your belongings. Advertised as vegan: No. This bag is advertised as faux leather. Pros: This is one of the more affordable items on Shopbop. It's a very modern approach to a carryall or laptop bag with a whimsical feel in its shimmery palm tree pattern. Cons: It may not go with everything in your wardrobe. Then again, it could let you get a little creative. 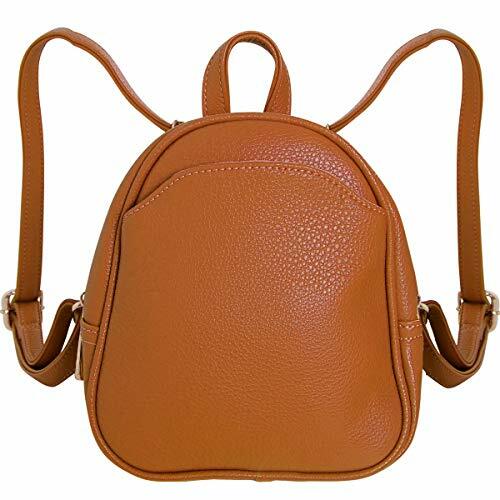 A brown vegan leather mini backpack purse for every day and every outfit. Turn it into a crossbody bag to sit comfortably on the subway or the bus. Zippers all the way around the top and sides with a gold-toned zipper. Pros: This is a bag you can really take anywhere and match with all your day tops and bottoms. It's laid-back, contemporary and uber stylish. Cons: It can definitely be an evening bag, but maybe for casual dress evenings only. Want more vegan bags and backpacks? We've compiled over 17 different styles of vegan bags ​and where you can buy them.